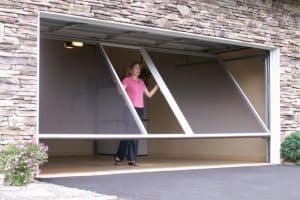 The Garage Door LifeStyle Screen is fully retractable and fits perfectly with your current garage door no matter the size. The LifeStyle Screen can be installed with hook and hanger or sliders that install in parallel tracks to your current garage door. The screens can then be easily lowered to instantly turn your garage into a screened in area perfect for parties or extra living space. The LifeStyle Screen also has a fully retractable passage door for exit and entry into the garage without having to lift the screen system. The screen system is also spring assisted to make lowering and raising fast and easy. With a LifeStyle Screen system you can transform your current garage space into a cool pest free living or party space in seconds. LifeStyle Screen System is installed with 2″x2″ architectural grade aluminum that is painted with a durable finish to provide years of rust free use. The system runs on maintenance free tracks separate from your current garage door tracks that run parallel to your current tracks which allows the screen system to store easily in the raised position. The LifeStyle Screen System also uses a spring loaded counter balance system to make raising a lowering super fast and easy. When the screen system is in use it occupies the same space as your garage door and even contains a door-within-a-door feature to allow easy entry and exit when the screen system is in place.